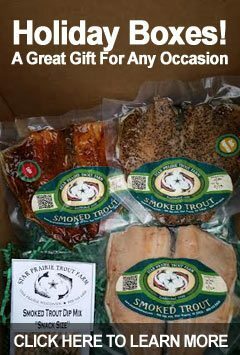 Premium Quality Trout are now available delivered direct from these springs to all Twin Cities area fish lovers. Quality is assured by our swift water flow, 47° degree temperature and natural, custom feeding. Freshness is assured by our proximity–less than an hour from Minneapolis and St. Paul–and by our commitment to personalized service. In our Class A hatchery, we raise trout from eggs. It takes about 22 months for trout to reach adult size of 12 inches long and 3/4 pound. As they grow, trout progress to different ponds according to size. Fishing! We feature the excitement of trout angling on the premises from May through September, and year-round by appointment. 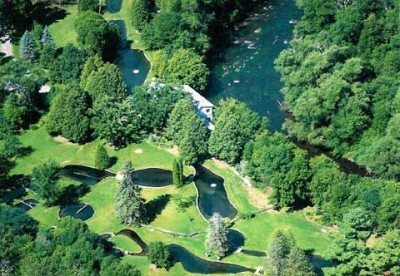 Our scenic, park-like grounds are bordered to the north by Apple River whitewater. No limit and no license required! Tackle is furnished and we will clean and ice your catch for a small fee. We suggest bringing a cooler to transport fish. Picnic facilities are also available. Call toll free 1-888-545-6808 or email us for more information.